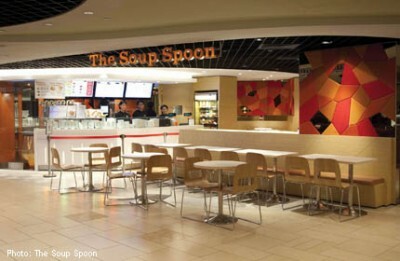 SINGAPORE - Within just a decade since it opened in 2002, home- grown food-and-beverage (F&B) firm The Soup Spoon has come a long way in terms of improving its business productivity. It is one of only five F&B companies here involved in a pilot programme by Spring Singapore which uses a computer system that efficiently and optimally allocates manpower staffing according to demand. The Optimised Workforce Management System, rolled out last month, will help The Soup Spoon save about $100,000 to $150,000 a year in terms of manpower costs. Besides speeding up the process of planning a store's manpower schedule, the system generates a cost-effective roster that takes into account the staff's skill sets and other factors, and is able to better deploy part-time workers. The Soup Spoon, which has 18 outlets, also leveraged on Spring Singapore's Part-time Pool programme to make work arrangements more flexible. It has doubled its proportion of part-time workers from 30 per cent in 2010 to 60 per cent today. Under the programme, some 3,000 part-time workers were trained and deployed by a recruitment firm to ease labour constraints faced by small and medium-sized enterprises (SMEs). Mr Andrew Chan, The Soup Spoon's managing director, said such productivity efforts have helped "mitigate uncertain economic conditions and overcome rising business costs". During a visit to a Soup Spoon outlet in Marina Bay Financial Centre yesterday, Minister of State for Trade and Industry Teo Ser Luck singled out the firm's high product-and-service quality, which he considered as "key ingredients to business success". Speaking to reporters at the event, he revealed that the Government will announce more schemes during Budget 2013 to further help SMEs like The Soup Spoon. He said: "It's not easy for SMEs now. We have to help wherever we can to enable them to continue to tap on the opportunities (available) and to survive." He said that as the Government examines how it can improve its current schemes for SMEs, it is also investing in local resources. He said: "With tightened labour, I think it is important for us to invest in our own resources - our local talent - to groom them, grow them, feed them into the pipeline for the SMEs. "That will create job opportunities and career paths for many Singaporeans."